Ninety eight percent of towns with public water systems chlorinate the water because any water supply, well water included, can become contaminated with bacteria. The Maine Center for Disease Control and Prevention recommends testing yearly for bacteria through a state certified laboratory. Typically, results are known within 3 to 5 days and we highly recommend you always chose to get a “count” (not results with just absent/present). On the water test report, there will be two results listed, coliform and e. coli (or enterococci). A source of coliform bacteria is usually from the environment (soil or vegetation, etc.) and e.coli is typically from feces. Both types of bacteria can cause diarrhea and vomiting. The Safe Drinking Water Act requires that both results are no greater than 0/100 ml. If your well water has been contaminated with bacteria, it is important to stop drinking your water and to chlorinate your well. You may do this yourself or we can do it for you. Once all the chlorine is out of the well, you should have your water retested. 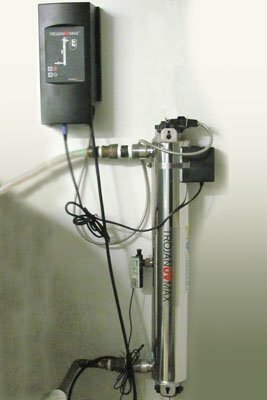 If bacteria is still present, you can repeat the processes of chlorinating your well. Chlorinating may not remove all the bacteria, or it may return later, and if this is the case, a UV light would need to be installed to make your water safe for drinking. For directions to chlorinate your well, please click here. By installing a UV Light, you are ensuring that 99.99% of the bacteria is removed. The system allows water to travel through its tube exposing the bacteria to an ultraviolet light which eliminates it without the use of chemicals. You cannot see, smell or taste bacteria, but the UV Light has an alarm that will activate if the unit is not functioning properly. This will alert members of your household that the water may not be safe to drink. The ultraviolet bulb on the light will need to be changed once every 12 months (or approximately 365 days); a green light indicates the system is counting back from 365 days. When approximately 30 days are remaining, the light will be amber and turn red when 10 days are left. When the red light is on, an audible alarm will sound once every day until the bulb is changed. Water that travels through the UV Light needs to be of certain quality for the unit to function properly, therefore, it may be recommended to pretreat your water to remove such issues as turbidity, iron or manganese. Call Haskells Water Treatment Inc. today at (207) 594-4947 or 1 (800) 244-4947 for more information about bacteria water treatment.